Season 3 of India’s biggest gourmet food festival—World on a Plate—produced by Gold Rush Entertainment was a huge success. For two days i.e. June 9th and 10th, VR Bengaluru was the epicentre of World on a Plate Masterclasses by celebrity and top-notch chefs for Indian and global cuisines including Mexican, Persian, Mediterranean and European, in their contemporary and modern avatars. This edition of WOAP 2018, was host to culinary geniuse’s, including Masterchefs George Calombaris, Sarah Todd and Ranveer Brar. The celebrity chefs conducted exclusive Masterclasses and mingled with budding professionals in select tête-à-tête. 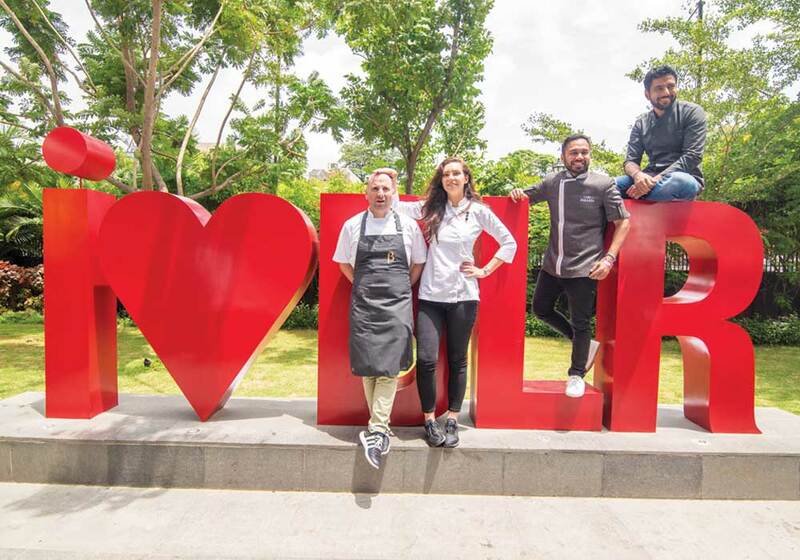 Visitors relished gastronomic delight over the weekend in grand style as a legion of legends from the MasterChef galaxy captivated their senses with the right ingredients. Italian fine dine restaurant Toscano hosted a red carpet for George Calombaris which gave his fans a rare occasion to meet their icon up close. Kickstarting the event on June 8th,2018, Chef Saransh Goila, re-created his signature “Goila Butter Chicken” – the best butter chicken in the world as Calombaris calls it. Saransh Goila, is one of India’s youngest celebrity chef. All of 31 years, Goila is an Indian Chefs, TV show host, author, food consultant and columnist. He set a record in the Limca Book of Records 2014 for the ‘longest road journey by a chef’, when he hosted India’s biggest food travelogue show, Roti Rasta aur India on Food Food Channel. He is also popular for his online food and travel show ‘The Spice Traveller’ and Health Challenge where he makes favourite Indian dishes healthier. June 9th commenced with the GiftAMeal with HUG – an initiative to collect funds for the underprivileged as part of a hunger management program—which aims to give away 100,000 meals in 2018. World on a Plate and Gold Rush have supported this noble initiative for three years. This edition of WOAP, hosted the “Taste Theatre” – with over 35 exciting pop-ups by the most sought-after chefs and mixologists, for the first time. George Calombaris is one of Australia’s top chefs and is equally recognised as one of the country’s favourite judges on MasterChef Australia, the highest rating program on local television. George’s hospitality group, MAdE Establishment, comprises 20 restaurants offering his signature Greek cuisine from premium to casual dining. In an exciting addition, patrons of the culinary world were invited to fine dine lunches & dinner, in an epically curated & cooked menu by Chef George Calombaris. There was a specially curated Hoegaarden paired lunch, where visitors feasted on lamb with a cauliflower curry seasoned with cumin yogurt perfectly balanced with Hoegaarden which smoothly went with the combination and palate cleaned up for the dessert course! Day 2 was also host to Masterclasses conducted by recognized institutes & restaurants in the Bangalore gastronomic scene. From desserts by Vineesh Jhony from Lavonne Academy, Molecular Gastronomy by Chef Abhijit Saha from Fava & Caperberry, & a crash course into Mexican Cuisine by Chef Vikas Seth from Sanchez & Siracha. June 10th included insights & classes on Anglo Indian, European, Mediterranean & Persian cuisine from your local favourite eateries like The Waverly, Byg Brewski, Aioli & Soda Bottle Opener Wala. Turning World on a Plate into a festival of flavours. The celebrity chefs also judged the participants on 10th June. Patrons casted their prized votes at “People’s Choice Awards” live! In a first, the Whitefield Arms also opened the gates to ‘Beer & Canine Street’ for patrons to enjoy a chilled brew and world class dishes with their pawed friends. The associate sponsors for the World on a Plate by Gold Rush Entertainment are Home Centre for the kitchenette and Philips Appliances for the kitchen appliances. Teacher’s Scotch Whiskey presented the prestigious WOAP Restaurant of the Year Award for 2018. Other partners include The Waverly (Hospitality), Pepsi (beverages), Hoegaarden (Beer), Radio One (Radio), Sumeru (Snacks), Uber Eats (Online Delivery). Conceptualized in 2015, Gold Rush was founded by Kiran Soans. A disruptive marketing and events company, Gold Rush believes in breaking conventional rules, to disrupt status quo and experiment with new marketing methods. World on a Plate is the brain child of Gold Rush, inspired by the CEO’s travel and research on world cuisines and food festivals across the globe. WOAP provides a platform for chefs, cuisines, restaurants and food lovers of India to come together and showcase the depth and array of Indian culinary art.